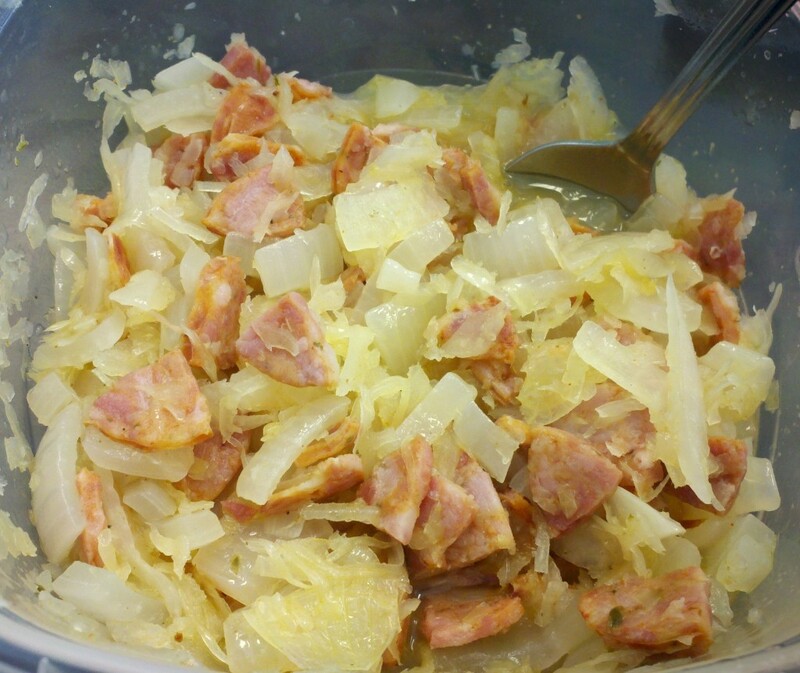 Sausage Sauerkraut Stew. Yes, my recipe is modeling in Tupperware. When choosing between elegantly arranging the stew for a photo session versus sleep, I chose SLEEP. Desperate times call for desperate measures! I’ve been spending my days remodeling a house… think hours upon hours of cutting fiberglass insulation and drywall. My joints ache. I’m sleep deprived to a degree that has dropped my IQ in half. But I still can’t bring myself to stomach fast food or pay for restaurant fare, so food must be home-cooked! Yesterday evening, after several hours of hanging drywall, I threw together the remaining food left in my fridge. The following recipe contains a whopping 4 ingredients, so as you can imagine my fridge is rather bare. I’m thrilled to announce that this recipe was splendid! Not only that, but it revived me just enough to finish cleaning the mess that is my kitchen. Unfortunately, it did not solve the problem of my diminished mental capacity, so it’s probably time for some sleep. 1. Quarter sausage lengthwise and subsequently thinly slice. 2. Cook sausage in pot until it begins to brown; a significant amount of fat should be released. 3. Add 1/2 cup of water to cover bottom of pot. 4. Add onion, sauerkraut, and cumin; cook on an intense simmer for 20-25 minutes. Cutting your sausage into VERY small pieces increases the amount of fat it releases when you cook it, which means more flavor released into the stew!